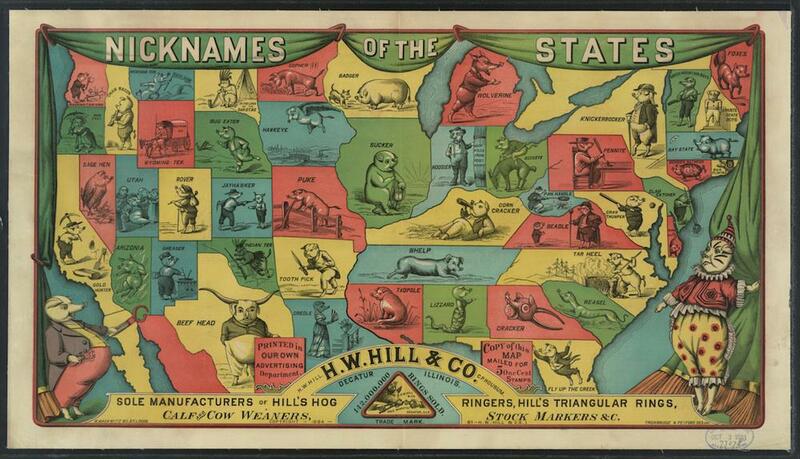 A nickname map of the American states, from 1884. This nickname map, printed as a promotional item by the livestock supply company H.W. Hill & Co. in 1884, is a wildly haphazard representation of the variety of American state nicknames in the late 19th century. Some of the sobriquets illustrated here are still very familiar: Ohio’s buckeye, New York State’s knickerbocker, North Carolina’s tar heel. Others are now baffling: Maine’s fox (a term referring to the number of Mainers who then lived in the woods, according to etymologist Barry Popik); Florida’s fly up the creek (a nod to the green heron native to the state). Many of the obsolete nicknames commemorated here through illustrations of cartoon pigs are not affectionate. The Kentuckian pig—the corn cracker, a derogatory nickname that eventually devolved into cracker—reclines lazily with a bottle of liquor. The Utah pig, who goes without a nickname, appears to be a pig husband surrounded by four pig wives. And Missouri’s pig, vomiting over a fence, illustrates the nickname puke, bestowed on a particular subset of the state’s working class by Illinoisians resentful of their own unfortunate epithet: sucker. Click on the image above to reach a larger version, or visit the map’s page in the Library of Congress’ digital collection. I first saw this image used as an illustration for a recent column on the topic of nicknames in Mosaic magazine; thanks to historian Robert Abzug for the tip. *Correction, Jan. 18, 2017: This post originally misidentified the state with the nickname “Tarheel” as Tennessee, rather than North Carolina.